If you don’t know what the colors represent, this is an aesthetically pleasing arrangement. If you know what the colors indicate, bummer dude. Have an idea but i’m not sure…and the answer is…. Not bummer, dude. It means you’ve put up a good fight. Mine are all on the brown, LIGHT blue, and silver end of the spectrum in the past (cough cough lots and lots) of years. Me too. 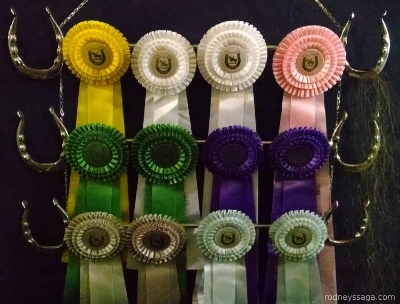 Although I’ve got to say that the ribbon I treasure most was a green. 6th out of 75 in a hunter class, and the top five were professionals. Pretty colors. My favorite color has always been purple.